Windpearl : I love you a bit. Eclectic, atmospheric hard electronica with a helping of chiptune sounds and drum & bass. "I love you a bit..." is the first album that was publicly released by Windpearl. Get ready for an eclectic blend of dark ambient tracks, melodies from 8-bit gaming consoles, some experimental hardtek and a little bit of electronic funk. We are sure that this first album will delight your ears with its poesy and diversity! 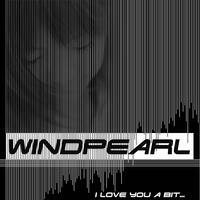 "I love you a bit..." is the result of the many different musical influences in Windpearl's life, the last one being the electronic style of Binärpilot that influenced his 8-bits tracks. The melodies resulted from his mood and emotions at that time: loneliness, anxiety, boredom. All tracks written, composed and mixed by Gabriel Hautclocq. Atworks also by Gabriel Hautclocq, some right reserved. License Eclectic, atmospheric hard electronica with a helping of chiptune sounds and drum & bass by Windpearl for your project. Play the music of Windpearl in your restaurant or store.